This trip is not only dedicated to L'Eroica special event, in fact you will ride for a week on the beautiful countryside of Chianti and Siena. Fantastic scenery, perfect roads and fine food makes Italy a road cycling paradise. 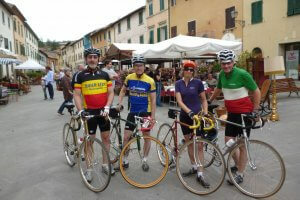 Private groups only – We can fully customize this L’Eroica Trip from 5 persons or more. 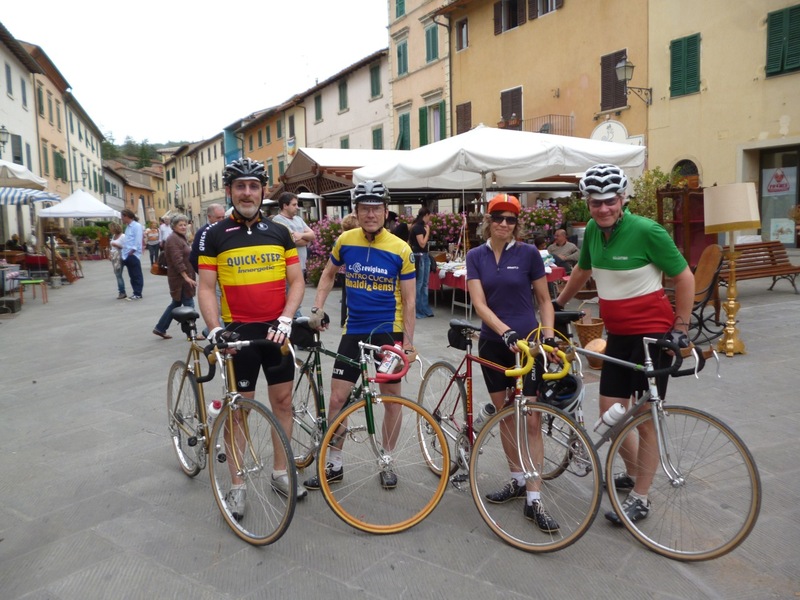 This trip is not only dedicated to L’Eroica special event, in fact you will ride for a week on the beautiful countryside of Chianti and Siena enjoying wonderful roads with little traffic. Tuscany is also well known for its incredible food and wine which are the perfect recognition after a hard day’s work. Your hotel will be right in the heart of Chianti and as close as it can be to all the great atmosphere of this wonderful event. 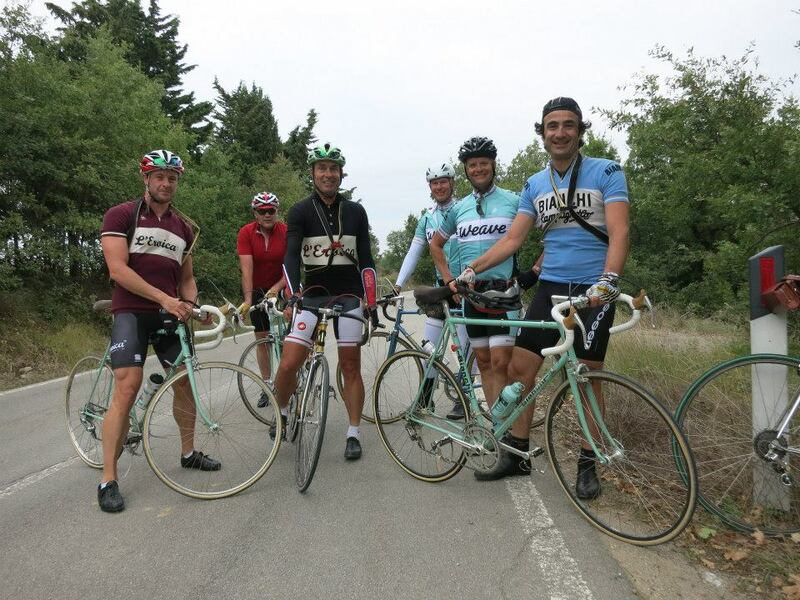 This L’Eroica trip 2019 and Chianti will be closed at only seven persons, so book early. This L’Eroica and Chianti Trip is really magnificent! 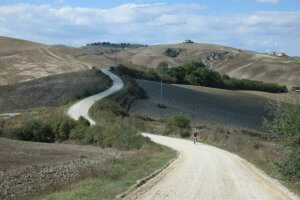 You will ride the "Strade Bianche". The Stade Bianche is divided in 8 pieces of white road for a total of just over 50 km. 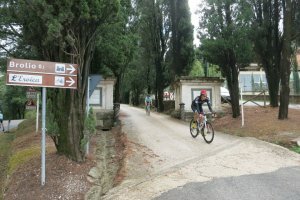 Cycle Tuscany on your second day in "La Bella Italia”. After your first exciting ride it’s time again for more physical action! You get on your bicycle for a beautiful ride in the Chianti region. You pass typical villages like Radda and Castellina. After your ride you will visit the famous vineyards in Castello di Brolio. Dinner included & overnight in Gaiole. 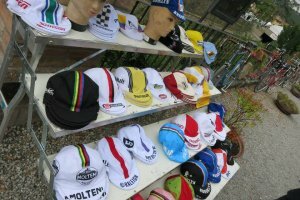 Picture yourself cycling in Tuscany! You will have a trainings ride. 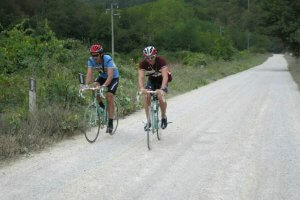 Biking throughout Tuscany is extremely good with perfect paved roads and stunning scenery. Enjoy todays ride! In the morning a trainings ride. 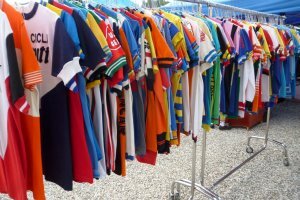 Later in the afternoon you visit the vintage market in Gaiole with many stands. 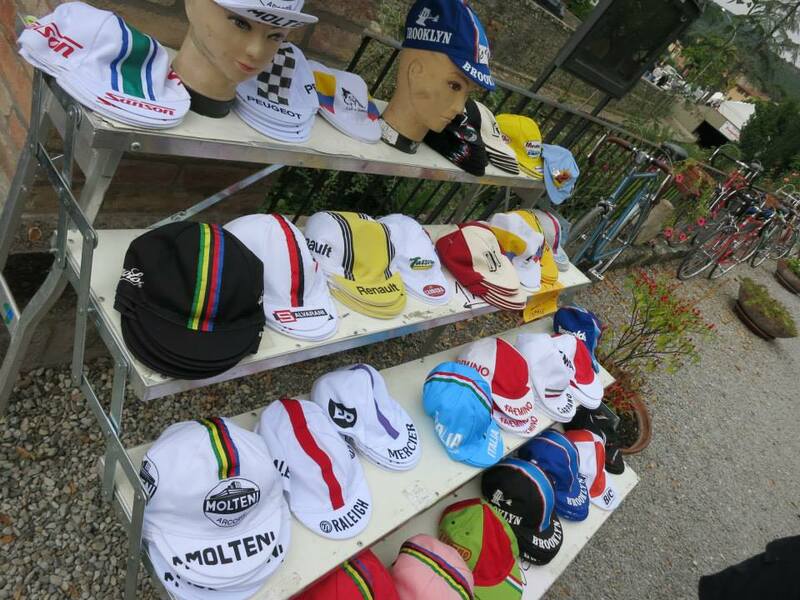 Here you find all kinds of cycling collector’s items. Dinner included & overnight in Gaiole. 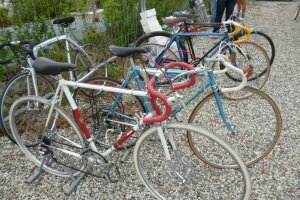 Trainings ride in the morning and for the ones participating at L'Eroica number pick up. Dinner included & overnight in Gaiole. Last trainings day before the Gran Fondo L'Eroica. Combine the best of Tuscany with physical action and the beauties of this very popular region! Tuscany is named number one on Forbes list "The best region to Live" and is in fact an excellent base for the upcoming Gran Fondo. Challenging climbs and long downhill runs makes Tuscany a Cyclist paradise. Last trainings day before the Gran Fondo L'Eroica. 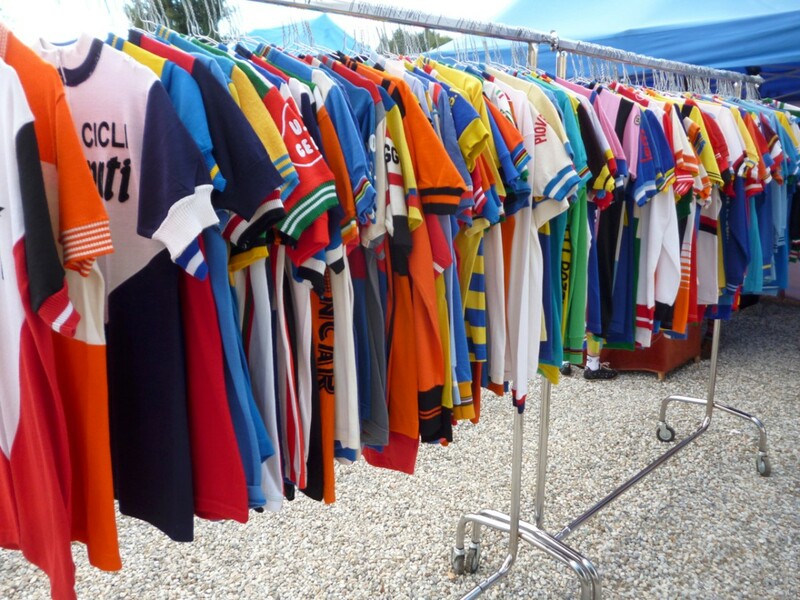 In 1997 the Gran Fondo L'Eroica started with some 100 riders. In the last edition of 2018 there were over 8000 participants from all around the world. 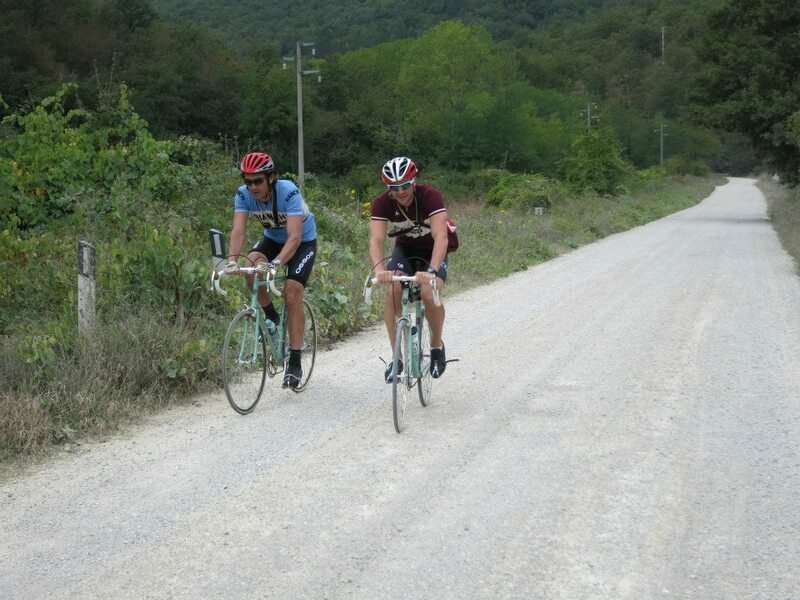 The L'Eroica passes the famous Strade Bianche. 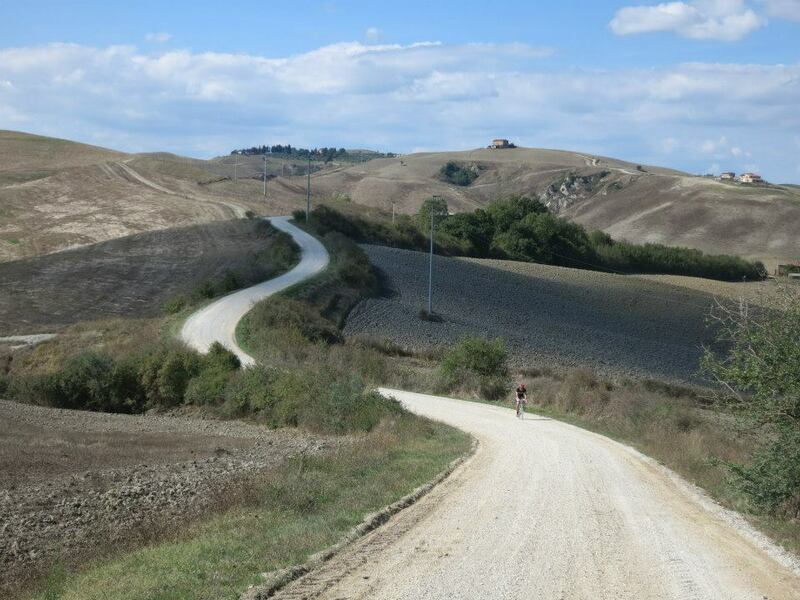 The world famous Stade Bianche refers to the white gravel roads in the Siena region and roughly 35 per cent of the course is on the Strade Bianche through the beautiful countryside of Tuscany. 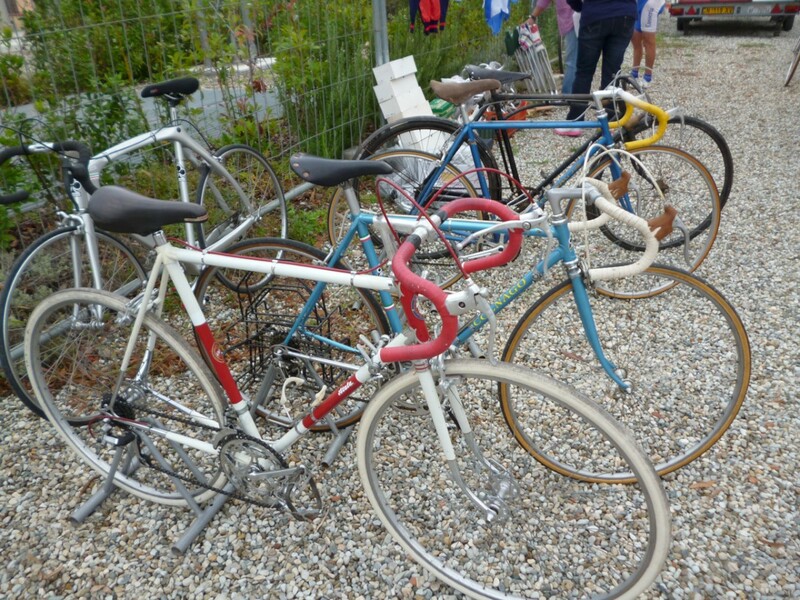 The L'Eroica event is specially made for the vintage cycling enthusiast. The week is full of festivities and finally the start and finish find place on Sunday 7th of October. The whole ambience of the event is superb. 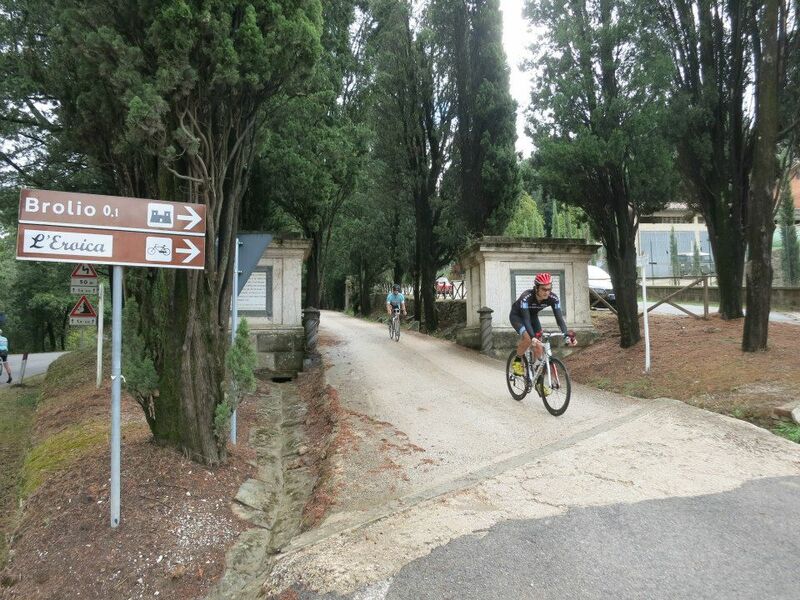 You can choose the following options 38km, 75km, 135km or the challenging 205 km. Enjoy your day! Unfortunately it’s your last day! It’s time to say goodbye, a good flight back home or else a pleasant stay in Italy. Transfers to the Airport Milan Malpensa or Pisa airport will be made by the Tour guide. Milan has three important airports; the most important airport is Milan Malpensa, from here many flights leave /arrive worldwide. There are many regular flights to/ from Madrid, Brussels, Amsterdam, Frankfurt, Berlin, Rome, London Heathrow, Copenhagen, Barcelona, Athens, Zurich and more very important cities from all around the Globe. The second airport is Milan Linate which has a lot of domestic and European flights to all important cities in Europe. There is a shuttle bus connecting Malpensa with Linate Airport. The ride between the two airports takes more than an hour. The third airport is Bergamo Airport (officially Orio al Serio International Airport) and is northeast of Milan, close to the city of Bergamo. This airport is especially used by budget companies like Ryanair. From Milan Malpensa Airport to Milan Central station are Malpensa Shuttle busses departing: every 30 to 60 minutes Length: 1 hour. From Milan Linate International Airport to Milan Central station busses departing every 30 minutes Length: 20 minutes. Bergamo Airport has no direct train connection, but there is a shuttle bus that takes you to the station in Bergamo. All prices are based on double rooms. This cycling tour is from 5 persons or more. We can fully customize a private group tour for the Eroica 2019 trip. When the tour operator confirms to us. We confirm to you and charge you’re a deposit fee of € 995 per person plus a € 15 booking fee.